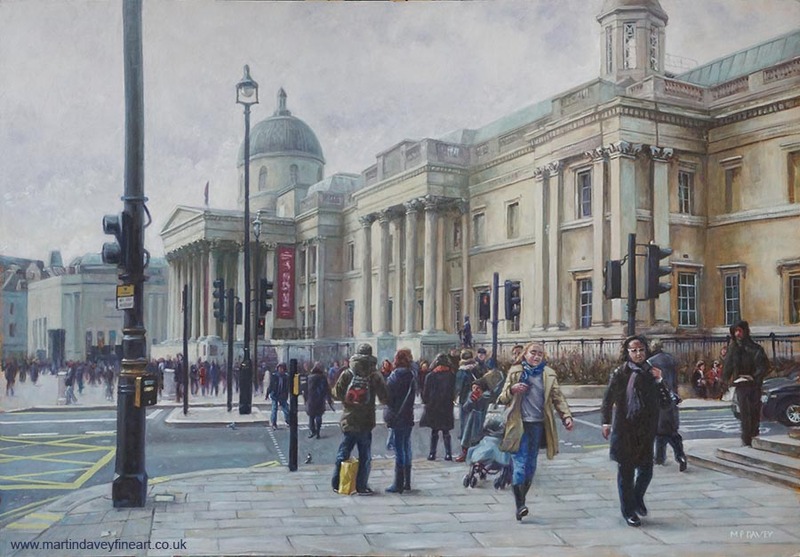 This painting was completed during autumn 2018 and features a view of the world famous National Gallery, in the heart of London, UK. It is situated in Trafalgar Square (which would be off left in the painting) and was originally built in 1832, the third such building to house the collection of 2,300 paintings dating from the mid-13th century to 1900 . It was designed by William Wilkins but was not a critical success, and soon become too small for its purpose. Now only the façade remains of the original building. In the 1980s an extension 'The Sainsbury Wing' was added which can be seen on the extreme left of the painting. Typically for the area it is always busy, so many pedestrians are shown in this winter view. Painted in oils on a mounting board surface, and sized at 44” x 37”.